Build and tune created the next exciting design in the world of motorcycling. This unique design merges the automotive and motorcycle worlds. We see the classic front engine (Slingshot) Dragster of the ‘60s & ‘70s combined with the modern aerodynamic designs of the Suzuki Haybusa sport bike. 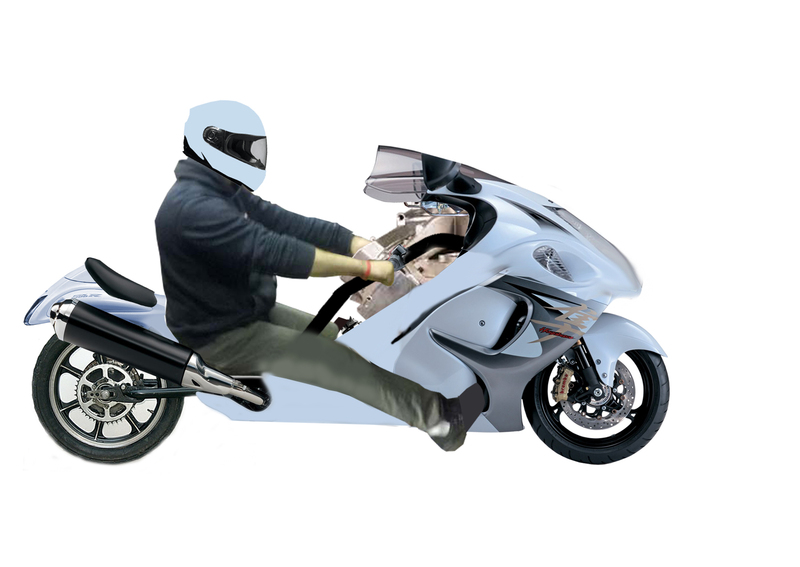 The Slingshot cycle has the seating position of the classic Dragster. The rider will sit behind the engine. Just like the driver of a front engine dragster. The Slingshot will use a performance proven Suzuki Hayabusa front suspension and aero package. The frame and rear suspension may retain some Hayabusa components. All other components will be designed and built by Build and Tune. The handlebars will be mounted near the rear valve cover for easy reach and comfort. A 4-link style linkage will be used to connect the handlebars to the front fork for steering. We will not use a transmission. We will use a slider clutch or a torque converter. The E.F.I. E.C.U. will be also used to control clutch/ tire slippage. Please call with questions or comments. We will use a large direct drive to the rear wheel.The programmable slider clutch or custom Torque Converter will be controlled with the E.F.I.E.C.U. The Build and Tune concept motorcycle will be easy to ride and ready for a cross country trip or a day at the drag strip. Our You Tube promo video will be a cross country ride on the historical Route 66. Can we build a slingshot cycle for you? Please call or write with your thoughts and comments.